Ah the final day of coverage for the Vancouver Fashion Week Fall/Winter 2015 season! And reflecting on the week's worth of extraordinary designs, it definitely was inspiring. On Day 7, my favourite designs of the evening came from Alcoolique, Jackson Rowe and Zuzana Hrubos: quite a variety of different styles. Alcoolique was such a cheeky collection: the makeup was bold, the designs were fun and flirty! I was a big fan of the dress you'll see below with the white hearts. What a cute detail! The sheerness of the blouse definitely offsets the sweetness of the full skirt and soft details. This might not be my usual style, as it's obviously quite casual with a bohemian flair, but there was something about the way Jackson Rowe's scarves draped and billowed as the models walked the runway that had me hooked! It made me remember how versatile a scarf can be: how it can be layered, worn as an accessory, or rather as another item of clothing. Add the sweet yet casual knee highs and suede booties to the mix and this look is definitely ready-to-wear right off the runway! Probably the most futuristic show of the FW 2015 season was Zuzana Hrubos' collection "Pulse". Obviously, my first thought when the models hit the runway was 'Tron! 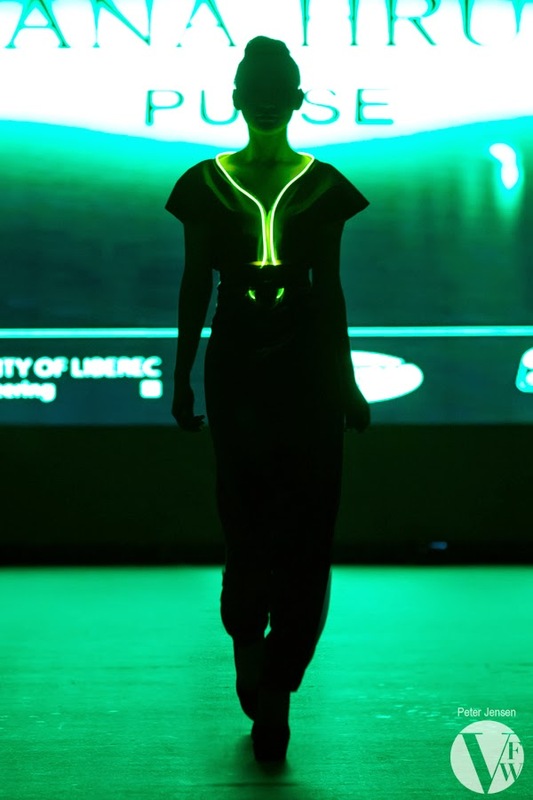 ', as all the looks were designed with integrated optical fibres. The designs also contained electro magnetic shielding textiles to protect the wearer against wifi and cell phone waves, you know, in case that's something you're ever worried about. I told you, it's futuristic fashion alright! I was particularly fascinated by this collection because I actually really wanted to make my own Tron costume for Halloween last year, and did some research on how to get the suit to glow - and let me tell you it is apparently no easy process, which is why I gave up on the idea - so kudos to Zuzana Hrubos for making these techie designs a reality. Many of you may recognize this Kassinka skirt from this recent post, but I just couldn't resist pulling it out again for this momentous week of fashion! I felt like I'd been wearing a bit too much black and white so far, so a solid dose of colour was definitely in order for the final day of VFW. From experimenting with items in my closet, I found that I actually quite liked combining neons and pastels together, so I opted to pair the pastel skirt with a flowy neon shirt and neon nails. I love how it makes everything pop. If you're feeling uninspired by your pastels this spring, try infusing the look with a splash of neon too! 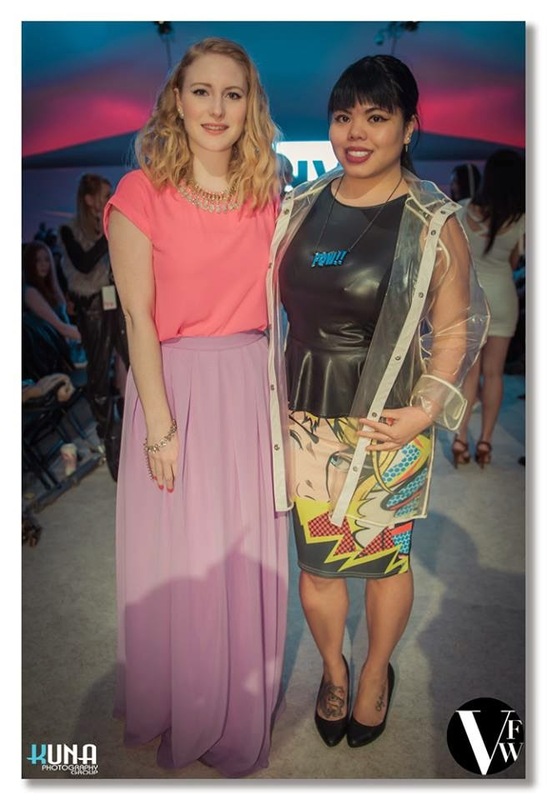 With the fabulous Vicki Duong of Flirty and Frugal: isn't her comic-inspired outfit bang on?? SUCH a stunning outfit babe! I love the mix of neon & pastel; such a great tip that I can't wait to try out for spring!